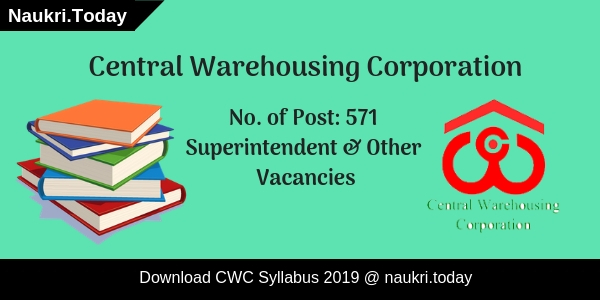 Dear Candidate, who had got applied for the Central Warehousing Corporation Recruitment 2019 can download the CWC Syllabus 2019. A Huge number of aspirants have applied for these various posts and going to participate in the given examination. An exam will be held in the month of April/May 2019. The syllabus is Very Important Part Of Exam and with the help of CWC Management Trainee Syllabus, Students will prepare In the better way in Exams. The Direct Link of Central Warehousing Corporation Syllabus 2019 PDF is Given here. About Central Warehousing Corporation came into existence in the year of 1957. It is well known for its short name as CWC. It is a public Warehouse operating offering logistic services to a diverse group of clients. Hence, CWC operates the 448 warehouses in all over India. Nowadays competition level is increasing rapidly, so in order to compete with this competitive environment, candidates need to CWC Syllabus 2019 study smartly & for that purpose they need proper study material. So, candidates just need to read the given article properly. 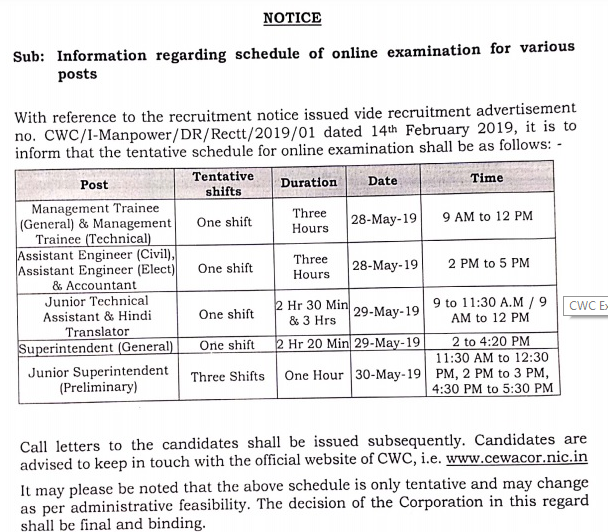 Fresh Update as on 30.03.2019: Central Warehousing Corporation has released exam date for Superintendent & Other Various Posts. The Examination will take place from 28 May 2019 to 30 May 2019. Candidates should check here exam pattern & Selection criteria for better preparations. Download CWC Syllabus 2019 from here. CWC Superintendent Recruitment 2019 Selection Process – CWC JTA Jobs : CWC Stenographer Recruitment 2019 Notification with detailed information is here. There are 571 vacant posts available in the organization. Candidates who are willing to apply for this CWC Recruitment 2019 could read the job notification and fill the respective application forms on or before the last date 16-03-2019. Selection process will consist of On-line Test, Document Verification, Interview & Skill test (Typing & Stenography). There is no interview for Junior Superintendent, Junior Technical Assistant & Stenographer posts and Skill test (Typing & Stenography) is only for Stenographer post. CWC Jr. Technical Assistant Exam Pattern 2019 | CWC Syllabus 2019: The CWC written test will be in an Objective manner so it has MCQs and will be conducted in ONLINE mode. The Test pattern may vary depends on post name. We provide complete details about the test pattern of an individual post. Check the tables according to the post name. Basic Agriculture (15) – Principles of Crop Production, Crop Protection, Post-harvest care, Grain Protection, Agriculture Extension, Horticulture, Animal Husbandry, Distribution & Economic Scenario. Chemistry (10) – Physical Chemistry, Inorganic Chemistry, Organic Chemistry. Financial Accounting (15) : Accounting Standards, Accounting Process and Principles, Preparation of bank reconciliation statement, Rectification of errors, Receipts and payment accounts, Single entry system, Amalgamation, Absorption and Reconstruction of Companies, Preparation and Presentation of company final accounts, Insurance Claims, E-Banking, RTGS, NEFT etc. Taxation (15) : Income Tax : Concept and various provisions as per Act, Set off and carry forward of loss, Deductions from Gross Total Income, Salient features/ provisions related to VAT and Service Tax. Botany (10) – Cell Biology: Tissue, Organ & Organ System, Genetics, Plant Classification, Diversity, Ecology, Life Process: Photosynthesis, Respiration, Circulation, Movement etc. Chemistry &Physics (15) – Chemical bonding, Organic Chemistry, Inorganic Chemistry, Chemistry in daily life, Motion, Force & Energy, Electricity , Magnetism, Light & Sound, Thermodynamics, Measurement. CWC JTA Syllabus – General Ability | CWC Syllabus2019:: Recent trends in Science and Technology, Transportation and Service Sectors, Human Development Programmes, Indian Society, Ecology and Environment, Heritage & Culture, Indian Agriculture, Natural Resources, Food processing. Central Warehousing Corporation JTA Syllabus for English: Synonyms, Grammar, One-word substitutions, Idioms & Phrases, Fill in the Blanks, Shuffling of the sentence parts, Error Correction, Comprehension, Unseen Passages, Vocabulary, Cloze Passage, Sentence Structure, Sentence Rearrangement, Antonyms. Subject-Verb Agreement etc. Conclusion: CWC Syllabus 2019 For 571 Junior Technical & Assistant Post. Candidates who had got applied for the Central Warehousing Corporation Recruitment 2019 can download the Syllabus and Exam Pattern of Central Warehousing Corporation JTA Exam Syllabus.